simply 'stuffed thing'. Dolma has a special place in Turkish cuisine. It can be eaten either as a meze or a main dish. It can be cooked either as a vegetable dish or meat dish. If a meat mixture is put in, it is usually served hot with yogurt and spices such as oregano and red pepper powder with oil. Zeytinyağlı dolma (dolma with olive oil) is the dolma made with vine leaves stuffed with a rice-spice mixture and cooked with olive oil. This type of dolma does not contain meat, is served cold and also referred to as sarma, which means "wrapping" in Turkish. If dolma do not contain meat, they are sometimes described as yalancı dolma meaning "fake" dolma. Dried fruit such as figs or cherries and cinnamon used to be added into the mixture to sweeten zeytinyağlı dolma in Ottoman cuisine. 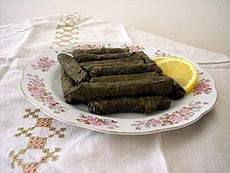 Vine leaves (yaprak) could be filled not only with rice and spices but also with meat and rice, etli yaprak sarma, in which case it was often served hot with yogurt. The word sarma is also used for some types of desserts, such as fıstık sarma (wrapped pistachio). Melon dolma along with quince or apple dolma was one of the palace's specialties (raw melon stuffed with minced meat, onion, rice, almonds, cooked in an oven). In contemporary Turkey, a wide variety of dolma is prepared. Although it is not possible to give an exhaustive list of dolma recipes, courgette ("kabak"), aubergine ("patlıcan"), tomato ("domates"), pumpkin ("balkabağı"), pepper ("biber"), cabbage ("lahana") (black or white cabbage), chard ("pazı") and mussel ("midye") dolma constitute the most common types. Instead of dried cherries in the palace cuisine, currants are usually added to the filling of dolma cooked in olive oil. A different type of dolma is mumbar dolması, for which the membrane of intestines of sheep is filled up with a spicy rice-nut mixture.